Last week just as we were getting used to sunshine again the weather reminded us it’s still winter. Sitting in a meeting Thursday afternoon hearing the wind and rain crashing around the building I pulled up the weather feed and you can see when it really hit. This shot is from about 4:25pm. 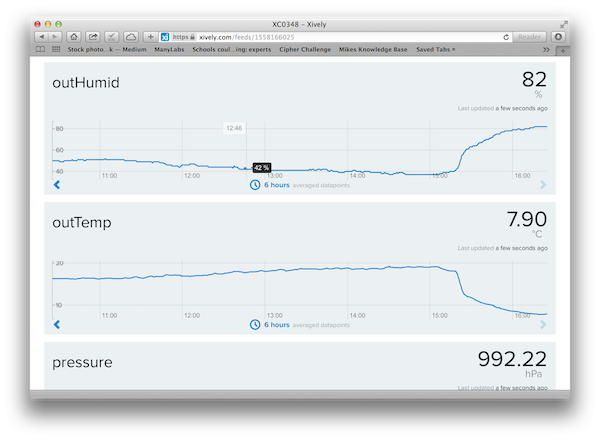 Temperature dropped about 10 °C in an hour. You can see the humidity shot up too with the rain. This morning we woke up to a coating of frost on everything, and the weather station told me that despite the bright sunny morning it was -0.4 °C outside. Guess there’s still more days to go skiing this season!